UK Power Networks has opened a consultation on a ‘Flexibility Roadmap’, which could also see the creation of new markets for distributed energy resources, such as solar farms and battery storage. If accepted the proposals will come into effect from 2019. The company plans to market-test the viability of flexibility services ahead of traditional reinforcement designed to meet the growth in demand until 2023. The Flexibility Roadmap consultation document sets out how it will create new opportunities for flexible energy resources like renewable energy, in response to the rapidly changing, decentralised, decarbonised and digitised energy landscape. 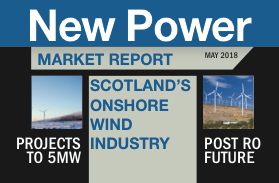 By 2023, UK Power Networks estimates its market for flexibility could be over 200MW. The company is working with Piclo (formerly known as Open Utility) which operates online platform Piclo Flex. The app matches energy providers’ resources with the network operator’s local need for flexible energy resources. Flexible energy resources will be able to register and engage with an interactive map that matches providers with pinch-points on the network, places where UK Power Networks is seeking flexibility to add capacity. The consultation will run from August to 8 October.